Durango’s formiddable block of seniors Maura Fitzpatrick (9) and Taylor Wolf (8) sent back a hit from Bayfield’s Jannika Pope during Tuesday’s match at DHS. Every win this week is key for the Durango High School volleyball team and its hopes of making a Class 4A regional tournament. Tuesday’s win was a little extra sweet on the Demons’ home floor against cross-county rival Bayfield. 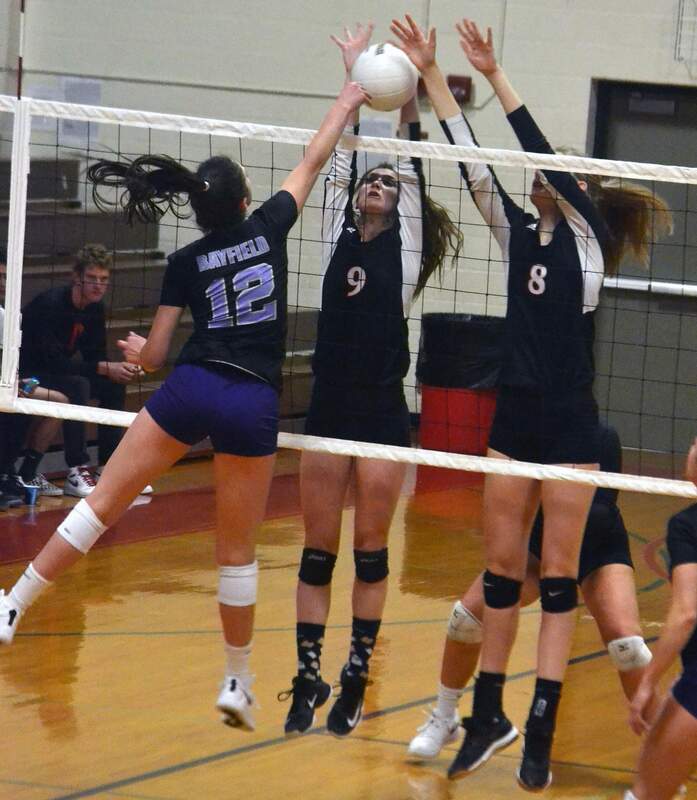 Durango (8-11) stormed out to a 25-16 win in Game 1 and battled back-and-forth with the visiting Wolverines en route to a 26-24 win in the second game. The Demons closed out the match for a 3-0 sweep when they won 25-23 in the final game. The first game ended with a cross-court kill from senior Sierra Martin that got past a diving effort from Bayfield’s junior Lana McKee. After Durango took a 9-8 lead in the set, the team built a 20-11 advantage. The second game was the best of the match, as the teams were tied 15 times. The Wolverines led 20-16 but couldn’t hold off the Demons. DHS junior outside hitter Millie O’Ketter led the Demons with seven kills, three blocks, 15 digs, two assists and an ace. Martin had five kills. Emmy Romero, a junior setter, had 10 assists. DHS senior middle blocker led the Demons with seven blocks, and she also had three kills. Sophomore Kyle Rowland had 10 digs and three aces. DHS senior Lily Chick also had nine digs, while Charlotte Hale, another senior, had 10 digs, too. Senior Maura Fitzpatrick added two blocks. “Taylor, Sierra and Maura were dominant blocking in the front row, and Lily and Charlotte had some game-saving digs and hustle plays int he back row,” Vogt said. BHS will head to Monument for the Palmer Ridge tournament this weekend. DHS (6-13) will travel to the Ponderosa tournament in Parker this weekend. The Demons are ranked 38th in the CHSAA RPI standings and need to be in the top 36 to qualify for a regional spot.